Location, location, location. Clean and modern room. Room was ready for us upon arrival at 12:00 noon. I loved the location! The checkin and checkout was very easy. 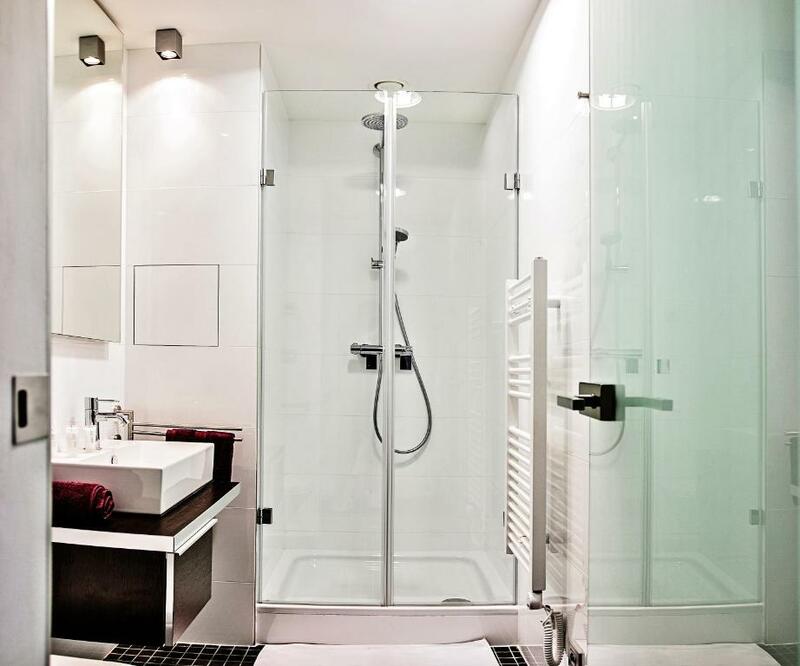 The room was well appointed and the bathroom even had radiant floor heating! The room is so big and clean and excellent. I like it very much. You can find whatever you want in a kitchen, like salt pepper etc. The location was great. Very close to restaurants etc. lots of room. Very modern apartment. Nice bed, nice bathroom, lots of storage space. Amazing view of entire venceslaw square. I WILL stay there again. Kitchen was nicely stocked with glass and cookware ( if I was going to cook). The staff was very friendly and the location was great. The only little issue is rides can't park in front - so rides have to drop you off just a few blocks away, easy walk(if not too much luggage). The unit was nicer than my home !!! 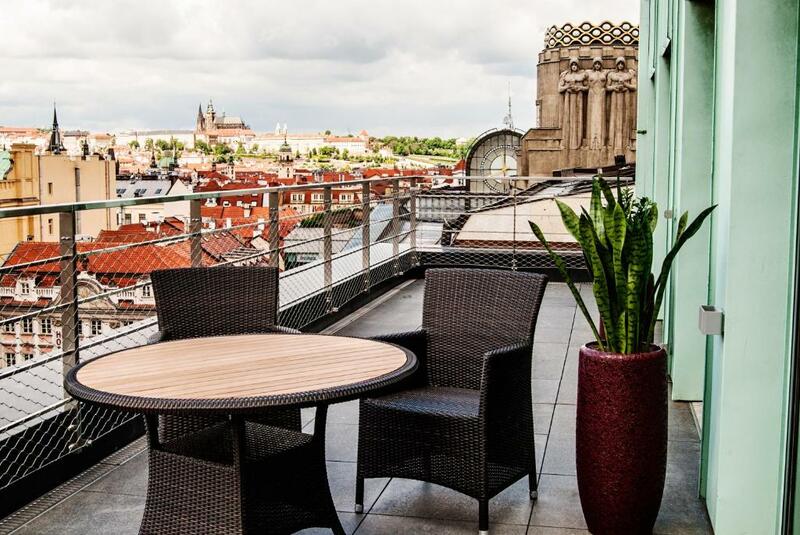 Lock in a great price for Wenceslas Square Terraces – rated 9.2 by recent guests! 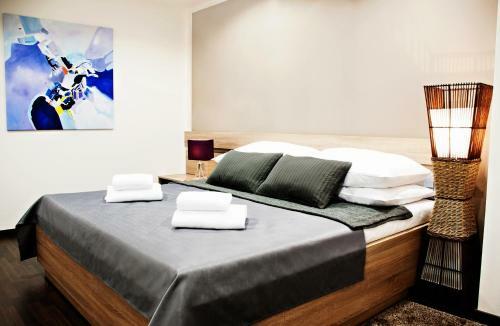 One of our top picks in Prague.Featuring views of the Wenceslas Square, the Wenceslas Square Terraces is a property with kitchen facilities in a prime location right on the Square, 100 feet from the Můstek Metro Station. Free Wi-Fi access is available. On prior request, breakfast can be delivered by catering service each morning at 9 am. The stylish apartments and studios all equipped with air conditioning, a flat-screen TV and a DVD Player. The fully equipped, open-plan kitchenettes are fitted with a coffee machine. Some units are coming with a terrace. The Old Town Square can be reached within 5 minutes by foot, and the Charles Bridge is just over half a mile away. Several shops and restaurants can be found around the Wenceslas Square Terraces, food delivery service is available upon request. 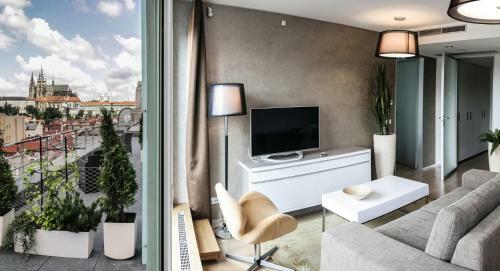 When would you like to stay at Wenceslas Square Terraces? This stylish studio features a sitting area with a flat-screen TV, a kitchenette and a bathroom. It features courtyard views. 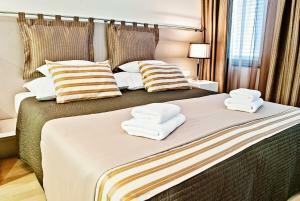 Please request twin or double bed when booking. This is subject to availability and cannot be guaranteed. 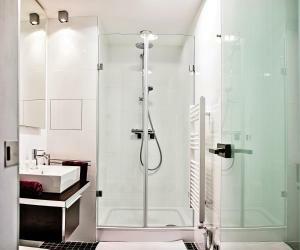 This stylish apartment features a separate bedroom, a sitting area with a flat-screen TV, a kitchenette and a bathroom. It offers courtyard views. This stylish apartment features a terrace overlooking the square, a bedroom, a seating area with a flat-screen TV, a kitchenette and a bathroom. This stylish air-conditioned apartment features a separate bedroom, a sitting area with a flat-screen TV, a kitchenette and a bathroom. It offers courtyard views. This stylish apartment features a living area with a flat-screen TV, a kitchenette, a dining area, a bathroom with a shower and courtyard views. This air-conditioned apartment features a bedroom, an optically separated sleeping area in the living room, and 2 bathrooms with a bathtub or shower and free toiletries. It features courtyard views. This stylish apartment features one separate bedroom with a bathroom, living room with a kitchenette, a flat-screen TV, a working table, second bathroom. The location cannot be better - our modern, stylish apartments are located on Prague's best address. From here, exploring the city is easy, if you are in Prague for work or leisure, you will enjoy quick access to all the best things this city has to offer. House Rules Wenceslas Square Terraces takes special requests – add in the next step! Wenceslas Square Terraces accepts these cards and reserves the right to temporarily hold an amount prior to arrival. Please inform the Wenceslas Square Terraces in advance if you would request a child's cot or a crib as they are subject to availability. 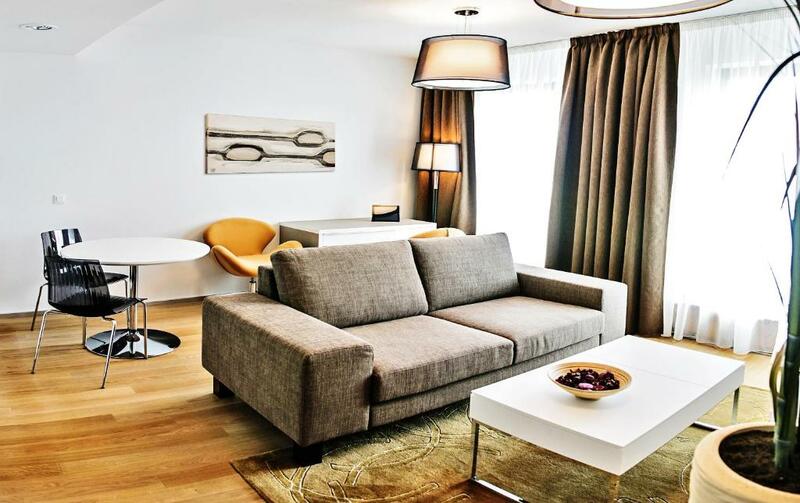 Guests requiring a confirmation letter from Wenceslas Square Terraces for visa purposes are subject to a nonrefundable fee of the first night's rate. Please note that the hotel is located in a pedestrian zone. If you are arriving by car, please inform the property in advance. Maybe the least functional bathroom, nowhere to place your personal items. Had to keep them on the floor. Also, no staff at hotel at night. Your on your own if you need anything at night. No receptionist, nobody at night. A/C did not work well, did not cool off in the afternoons. Very clean. Staff emailed in advance to see what time we would arrive to ensure someone would meet us. We were able to check in early! If the apartment rate could adjust a little bit would be perfect. Occasionally last minute deal still achievable without cancellation. Is a service apartment with modern interior. The location is excellent and walking distance to most of the tourist area. Subway and supermarket is next to each other and just a walking distance. 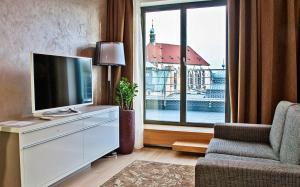 A common balcony is located at level seven and virtually have a panorama view of Wenceslas Square. I reserved a king room. I regret it. The king bed was 2 singles pushed together but still keeping their singles linens. I was there as a couple and we basically both ended up sleeping on one of the twin beds. If you are traveling as a couple, reserve a Queen room. Also, the pillows hanging on the headboard were dirty. You could tell people lean against them and they don't get cleaned regularly. If it werent for these 2 things, our stay would have been perfect. A small thing but the bed was more like 2 single beds together with separate mattresses than a large double. Results in one of us falling down a hole in the middle of the night. Like I said very small complaint. Otherwise the place was perfect for us. Everything. Location. Facilities. The balcony view. The cleanliness and comfort in general. Value for money. The website makes it look like all rooms have a terrace/balcony, which of course isn't the case. I am not saying a terrace is necessary, but that the website led me to believe that my room would have it. The phone in the room did not work properly (could not dial out or receive calls and they didn't know what to do about it) and you could not get Czech television channels on the TV (which they again could not fix - probably would not matter to people who only want to watch CNN or Netflix, but then for all I know those didn't work either). There was a weird, annoying sensor of some sort in the corner of the bedroom ceiling that flashed each time one moved and a strange hum (some kind of heating or ventilation) that cycled on and off all night. Room service came almost every day and changed the sheets, which was totally unnecessary - this is place is confused as to whether it is a hotel or a holiday apartment rental, which is what I was expecting. The bedside lamps had 25 watt bulbs so impossible to read in bed and there wasn't a single floor lamp or table lamp in the place, just annoying overhead light fixtures. Shabby couch in sitting area. Barely enough countertop space in kitchenette to make a cup of tea. Will not return to or recommend this place. Location was excellent. Good bed and an adequate bathroom with nice water pressure and hot water (but the shower was in the bathtub with a plastic shower curtain). There was no nighttime noise as room looked into a quiet courtyard. 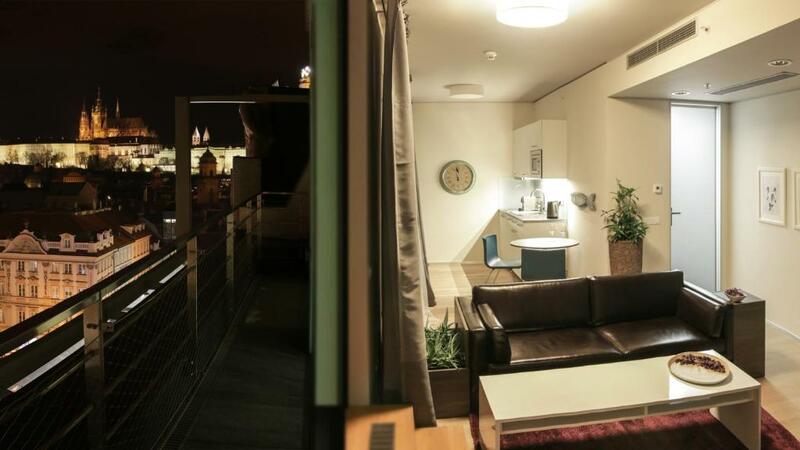 The apartment takes the full amount as a holding deposit from your account although the website states pay on arrival and that you had to provide 150 euro deposit. A bit confusing but all resolved on email prior. Also we where asked our arrival time, we provided this to which on arrival we had to wait for 15 minutes as the reception was on a break. Location is less than 5 minutes from all the major attractions so perfect. We where in a room at the back of the apartments so although we didn’t get any views from the room, it was extremely quiet.